Born in Beirut, Mohammed Rouda has been a film critic and a journalist for over 40 years‎ now. Before assuming his current position as Senior Editor/Film Critic at the pan-Arab daily Asharq ‎Alawsat, Rouda was a Festival Consultant and Associate Director of the Competition for the Dubai International Film Festival (2005-2008). 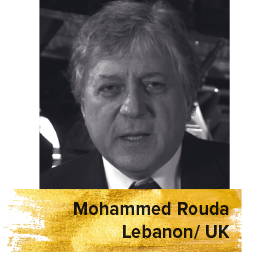 Rouda also worked as a producer and presenter of film shows for Abu Dhabi TV, MBC TV, and Kuwait Television.‎ A prolific writer, he is the author and publisher of The Book of Cinema, an annual review of Arab and international films, and also Arab Cinema in the Sea of Changes. He wrote the original screenplay for the 2006 Saudi-financed Arab feature film WHAT'S UP (Keif al-hal?). Mohammed has been a member of the Hollywood Foreign Press Association (which gives out the Golden Globes), FIPRESCI and The London Film Circle.